Where did you get pcsx2? From the ppa try to install the debug package, the best will be to compile a debug version. Which plugins? I got pcsx2 form Ubuntu software center. I think it is my PPA, but I do not remember that I put the zerospu2 plugins! Anyway, change the pad plugin to onepad, change the spu2 plugin to spu2x. And it will be better. 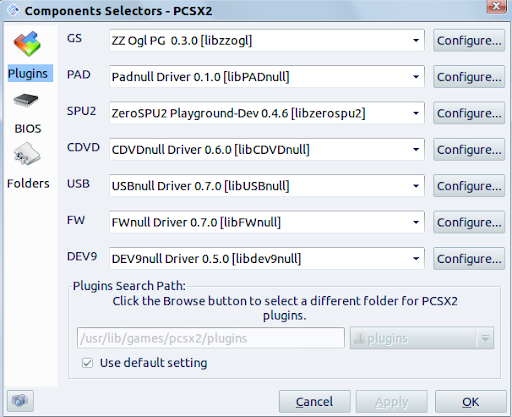 Note, you can also try multiple GS plugin (zzogl or gsdx) not GSnull. Note that GSdx on linux is purely software and so it need a very high CPU.